PHYLLIS THOMAS passed away peacefully at St. Therese Villa on Tuesday, September 11, 2018 at the age of 99 years. 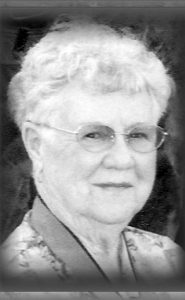 Phyllis is survived by her daughters, Sandra (Herb) Curran and Beverly (Arnold) Sommerfeld, both of Red Deer; her sons, Garry (Karen) Thomas and Lawrence (Sandra) Thomas, both of Lethbridge, as well as four grandchildren and four great-grandchildren. She was predeceased by her beloved husband, Bruce and her parents, Ernest and Lillian Bates. Phyllis was honoured with a Life Membership in the Alberta Fish & Game Association in 1988 for her many hours of volunteering. She also served on many various committees with her husband, Bruce, who was also awarded with the same Life Membership. She loved being outdoors and she adored her animals. Her yard was always beautifully adorned with flowers, meticulously manicured trees, garden paths, a swing, a fountain and even a flowing goldfish pond in the summer. For those who wish, donations in Phyllis’ memory may be made to the Alzheimer Society, #40, 1202 – 2 Avenue South, Lethbridge, Alberta T1J 0E3 or to the Lethbridge PAW Society, Box 255, Lethbridge, Alberta T1J 3Y5. We attended the beautiful service today. Bev did a great job with the eulogy. Sandra made a beautiful video tribute of Phyllis and Bruce & her family. Being neighbours for many years whenever we had a visit Phyllis talked non-stop about her kids and grandkids! Phyllis & Bruce were the best neighbours you couid ask for. Their yard was emaculate. They were perfectionist. Whenever I trimmed our spruce tree I’m out front yard she offered me advice. Phyllis and our mother grew up on farms in the Kipp, Coalhurst area. Phyllis told me how they went to dances together. They both shared a love for horses. I really missed the Thomases when they moved to St. Therese. Phyllis offered rhubarb to me every summer. I have some that I planted in our backyard from their rhubarb. RIP Phyllis & Bruce!! You both will be missed. I think of both of you often.